YTHDF1, also named as YTH domain-containing family protein 1 or C20orf21, is a 559 amino acid protein, which localizes in the cytoplasm. YTHDF1 specifically recognizes and binds N6-methyladenosine (m6A)-containing mRNAs, and promotes mRNA translation efficiency. M6A is a modification present at internal sites of mRNAs and some non-coding RNAs and plays a role in the efficiency of mRNA splicing, processing and stability. YTHDF1 acts as a regulator of mRNA translation efficiency: promotes ribosome loading to m6A-containing mRNAs and interacts with translation initiation factors eIF3 (EIF3A or EIF3B) to facilitate translation initiation. 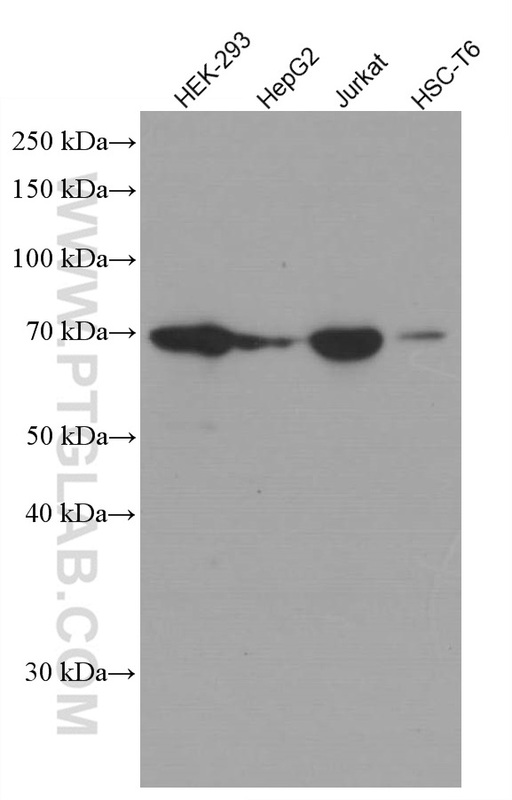 YTHDF1 exists two isoform and calculated molecular weight of isoforms are 61 kDa and 21 kDa.